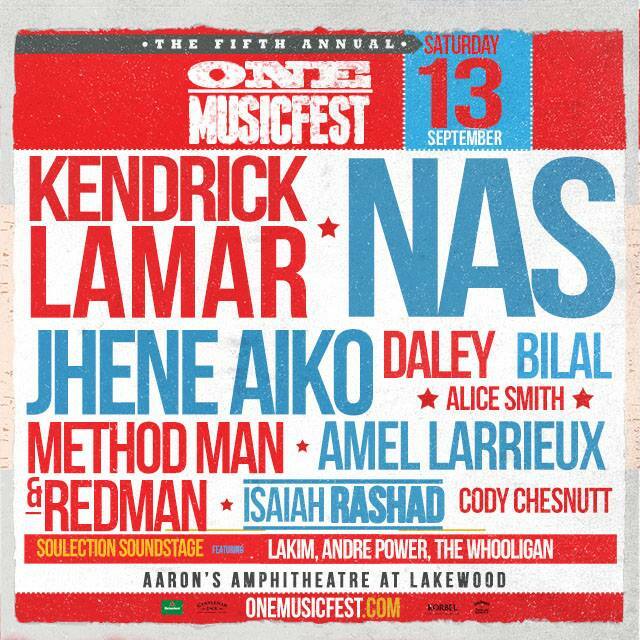 “ONE MusicFest is proud to announce that Kendrick Lamar, Nas, Jhene Aiko, and more will headline this year’s festival held in Atlanta, GA. The daylong event will take place on Saturday, September 13th, 2014 at Aaron’s Amphitheater at Lakewood. Tickets are now available through LiveNation.com and all major digital retailers. ONE MusicFest is responsible for bringing together the best of urban alternative’s legends and contemporaries through music and visuals. Each year, attendees get the opportunity to witness a wide variety of sounds. From rock to hip-hop, electro, reggae, funk, disco, house, alternative and soul, ONE MusicFest has created an atmosphere where everyone can enjoy and discover music. The ONE MusicFest has also launched an app that is now available for download! By searching for ‘ONE MusicFest’ in your app store, you will be able to download the app for free! The app comes with a music playlist, ticket buying ability, an artist photo booth, which allows you to take photos with some of your favorite artists, festival line up, sponsor’s page and more. This has added much anticipation for the big day, as all the artists on the line up are excited to be apart of this experience. This year marks the festival’s 5-year anniversary. The event has quickly grown since it first started in 2010 and now represents one of the largest most highly anticipated celebrations of the arts in the Southeast with an expected attendance of 15,000 people this year. For this milestone, ONE MusicFest organizers have spared no expense in giving festival attendees an unforgettable experience. In addition to seeing some of today’s biggest artists, patrons will also get the opportunity to immerse themselves in visual arts, food, games, and interactive activities.